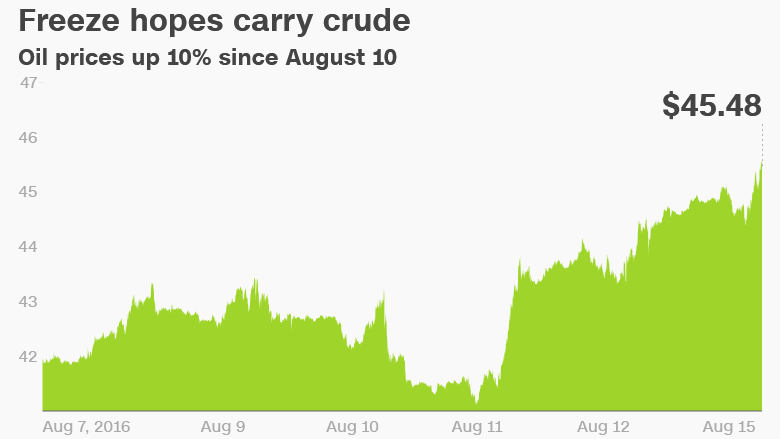 Hopes for a big "freeze" are heating up oil prices -- once again. Prices surged 10% over just the past three trading days to above $45.50 a barrel on Monday. Just two weeks ago, oil had fallen below $40 a barrel. No, the big oil rally isn't being driven by signs of accelerated growth in the sluggish global economy. In fact, the latest stream of economic indicators have been sluggish. Instead of fundamentals, crude is being carried higher by vague hopes that OPEC, Russia and other major oil producers will agree to "freeze" production. The latest freeze buzz is being driven by unscheduled September OPEC meeting in Algeria, and new comments from Saudi Arabia's energy boss. But this is not the first time that hopes of a freeze has driven mini rallies in oil. In fact, the last attempt to freeze production in April failed spectacularly. Oil watchers warn that prices could be getting ahead of themselves. "We caution bulls on becoming overly exuberant," Michael Tran, commodity strategist at RBC Capital Markets, wrote in a note. "Any plan of action would largely be symbolic and sentiment-driven." Why symbolic? Because OPEC is already pumping more oil than it ever has before. In other words, freezing production -- at extremely high levels -- wouldn't really help fix an oversupplied market. In fact, oil is being pumped at such a frenzied pace that there are reports of storage issues from all over. "Russia, Iraq and Iran are maxed out -- or close to it," Michael Wittner, global head of oil research at Societe Generale, wrote in a report. Wittner said that while a freeze deal "is not out of the question," he is "skeptical that anything concrete will happen." Saudi Arabia's new energy minister, Khalid al-Falih, fanned the freeze flames late last week in an interview with the Saudi Press Agency. 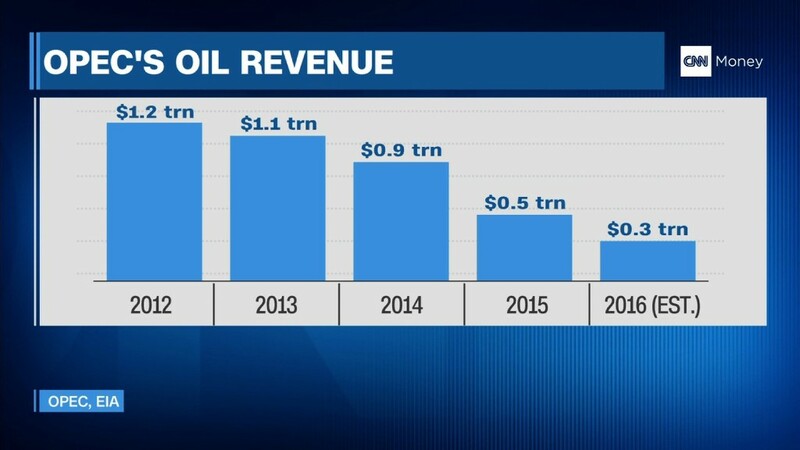 He said the Saudis are "watching the market closely, and if there is a need to take any action to help the market rebalance, then we would, of course in cooperation with OPEC and major non-OPEC exporters." Al-Falih added that the meeting in Algeria next month provides an "opportunity" to discuss "any possible action that may be required to stabilize the market." While the comments encouraged oil bulls, Wittner noted that al-Falih's comments were similar in tone and content to what he had said in June after the last OPEC meeting. In other words, he may not be signaling a big shift. Saudi Arabia is leading the OPEC strategy of flat-out production. The kingdom pumped 10.5 million barrels per day in July, up by 30,000 from June and a new all-time record. Iraq, Iran and the United Arab Emirates also boosted their output last month, compensating for shrinking production from embattled OPEC members Nigeria and Venezuela. Meanwhile, there are signs that U.S. shale companies are also drilling more, threatening to deepen the oil glut. On Friday, Baker Hughes said the number of active U.S. oil rigs soared by 17 last week, mostly in the Permian Basin in Texas. That was the seventh straight weekly rise and the most profound in just over a year.